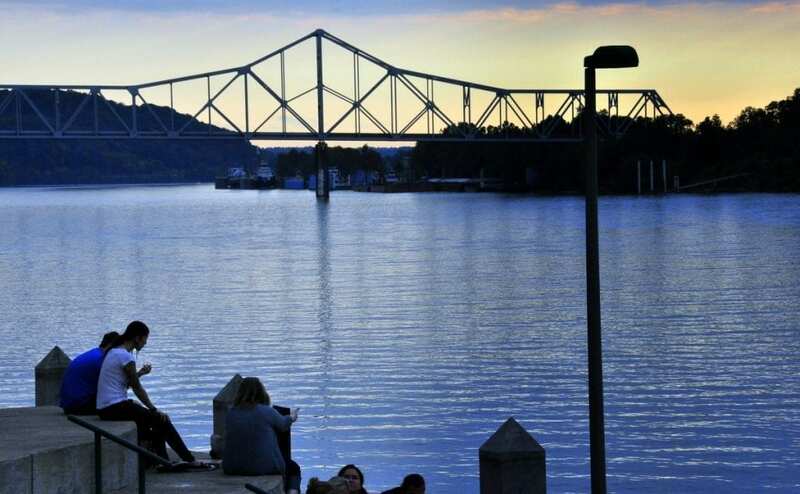 Crowds gather to watch the sunset in sight of the Silver Memorial Bridge at Point Pleasant, West Virginia. The next morning the Point Pleasant Register published a story: “Couples see Man-Sized Bird… Creature… Something.” By Thanksgiving, reports of missing pets and TV interference were being attributed to the winged visitor. More eye-witnesses came forth. 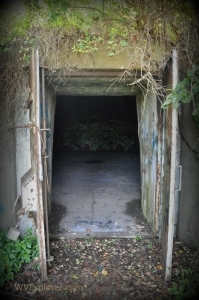 Someone dubbed the creature “Mothman.” Folks who lived near the river began locking their doors at night. 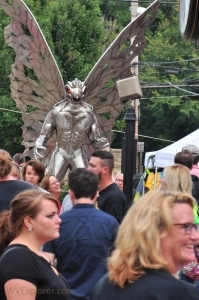 Mothman watches over crowds during the Mothman Festival. Tales of the winged horror circulated for more than a year, but, then, a real horror occurred. On Dec. 15, 1967, the Silver Bridge at Point Pleasant collapsed, dropping 47 motorists into the murky Ohio River. Some say sightings of the Mothman ended then. Folklorists speculate that more important matters were being discussed. Others believe the creature had been tied to the collapse — as a cause or portent — and that it had disappeared after the tragedy. Enter writers Gray Barker and John Keel. Barker in 1970 popularized the legend through a series of books. He also tied reports of the creature to the collapse of the bridge and introduced the world to the concept of “Men in Black,” stealthy agents employed to cover-up human encounters with aliens. 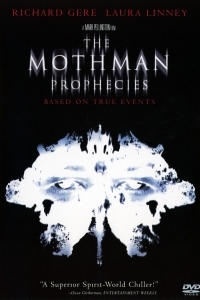 Keel’s book became the seed of the 2002 film “The Mothman Prophesies,” which popularized the tale on a scale not been seen before. The film has drawn thousands of visitors annually to the community, though Jeff Wamsley, co-founder of its Mothman Festival and Mothman Museum, says chroniclers have confused the tales. Reports of encounters with the Mothman didn’t end with the collapse, he says, and many aspects of the tale are still left to be told. “Most journalists don’t understand that there were multiple witnesses — more than 100 in the first few years,” Wamsley said. “And things went on for months after [the bridge collapse]. The movie pushed that aspect, and we [also] have newspaper clippings from ’68 and ’69, even into the ’70s. Making sense of such a series of events must take real effort, I proposed one day during a recent visit to the museum. I am fascinated by the tale and happy to consider the events at length, turning and twisting the matter like a Rubic’s Cube. As I watch visitors wander in and out of the museum at 400 Main Street, carrying books, tee-shirts, and other Mothman memorabilia, I reflect on how well-suited such a legend is to this, the western entrance to the state. Here where the Kanawha River descends out of the hills to join the Ohio, a strange but wholesome energy runs through the land. The land seems to accept the tragedies that came before. If Jeff is right, visitors will continue to make a habit of visiting Point Pleasant and strolling its Main Street southward to the point, so seemingly removed from monsters and battles and murders and mass death. The Mothman Museum is open from noon until 5 p.m. daily, though it is closed on Easter, Christmas, New Year’s, and Thanksgiving days. Admission is $3 for guests 11 years old and older and $1 for guests 10 and younger. Visitors should call ahead in winter in case of inclement weather.